Advantage play is betting with a mathematical edge over the house. This could be through methods such as card counting in blackjack or exploiting a fault on a roulette wheel. There are multiple ways of gaining an an edge over a casino. One of the most well known stories of advantage play was covered in the film 21. Based on the true story of 6 MIT students who were trained to count cards in blackjack. The advantage play method that I have been using a lot lately. Is using casino sign offers to give myself a long term profitable edge. Casino offers are something that I have taken advantage of in the past. However recently I have seen that I there are a huge amount of plus ev casino offers I have been missing out on. 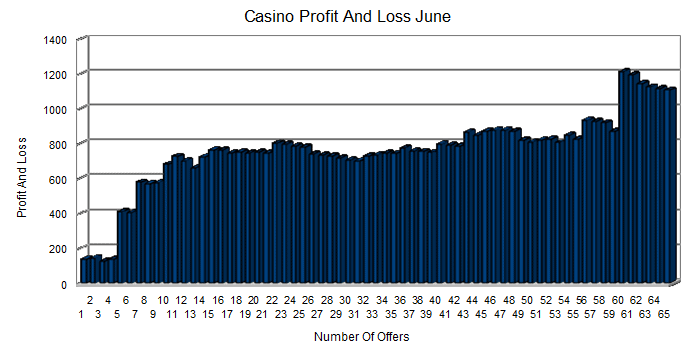 Lets take a look at a casino offer which offers a good opportunity to make money. 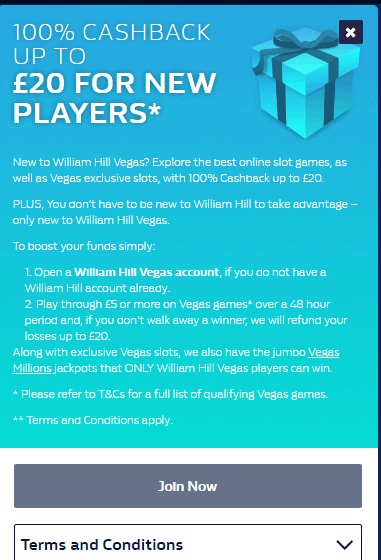 This is a cashback offer from William Hill where you get a cash refund of your losses up to £20. A really simple offer where you will either break even (lose nothing) or make a profit. Looking through the terms you can use roulette for this offer. A simple strategy would be to bet £20 on either red or black . – If the bet wins then you make £20 profit. – If the bet loses then William Hill refund the £20 as cash within a 48 hours period. You have broke even. There are a huge amount of casino bonuses available. From sign up offers to recurring deposit bonuses casino’s are throwing money at customers. You need to be aware of a few things when looking to exploit casino offers. Wagering Requirement – A lot of bonuses will require you to bet a certain amount before the bonus money can be withdrawn. For example you be given a £50.00 sign up bonus which is required to be wagered 30 times. Game contribution – Often casino’s may exclude some games from counting towards bonus wagering. For example blackjack and roulette may be excluded. House Edge- When wagering a bonus you want to look for a game/slot with lowest house edge. This is so that you give yourself the biggest chance of turning a profit from a bonus. There can be quite a lot of factors to take into account when looking to make money from casino bonuses. Not all casino’s use the same bonus policies. It can take quite a lot of time reading through the terms and conditions. But you need to be sure the bonus terms are giving you a profitable edge. It may sound like a lot of work. However a lot of these offers have an expected return on your investment of 20% or more. Most professional bettors are happy with a long term return on investment of 3-5%. So consistently getting an expected roi of 20% or more really adds up once you start hitting all the offers available. Sign up offers can give you a profitable advantage over the casino. Casino bonuses come in lots of different forms. From cashback offers to deposit bonuses, risk free bonuses, free spin bonuses, sticky bonuses. There are hundreds of these offers available and you can manually find them with a quick google search. Then go through the terms and conditions to work out whether there is a profitable edge. A service that I use called Profit Maximiser does a great job of condensing all this information. It highlights the best opportunities available and gives the optimal strategy for exploiting them. This is a really efficient way of taking on these casino bonuses. It saves a me a tonne of time as I don’t have to read through all the terms and conditions. I can just find the offers. Look at the best strategy to use and grind my way through them. Much like standard value betting exploiting casino bonuses is not risk free. By consistently taking value over the long term you will make money but in the short term you could lose money. That is why good bankroll management and solid staking are key. Overall it is really worth taking advantage of these offers. Adding advantage play to your portfolio is going to be very profitable in the long term. These offers really add up if you put the volume. Here is an example of my results from the month of June. Here are two of the best low risk sign up offers currently available. Do you currently use any advantage play methods?